Little just came running through the house with a blanket, 3 random Legos snapped together and a plastic horse. He said he was going outside to play with Sam, his favorite neighborhood dog. Why, you might ask, would he need those accessories? Good question. But I guarantee he knew exactly why he wanted each specific item. 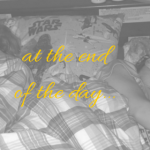 It made me realize how differently my kids and I see the same things. I see three mismatched plastic animals, two Matchbox cars and a boy who’s going to get poked all night long. Little sees loved ones who need some good cuddling. I see a pantry that could use some organization and scrubbing. Big sees quiche, cookies and recipes yet to be discovered. I see a disaster waiting to happen as I carry the laundry baskets to the washer. Little sees a world of bad guys and superheroes—where he still plays both, trying to determine which side he likes best. I see olives and noodles that I just. want. him. to. eat. Little sees finger puppets and trumpets. I see an open closet that someone was too lazy to close. Big sees a monster who won’t let him sleep. I see a shadow on the ceiling, proof that it’s dark and time to go to sleep. Little sees a “witch on a moonlight ride” and wants another song. I can’t help but wonder, when was the last time I really let my imagination run wild? Was it for play? Or in fear? I’m pretty confident I know the answer. And it’s a shame. Because if watching my kids is any indication, my imagination has all kinds of wonderful potential. I think it’s time to dust it off and find out just where it can take me. 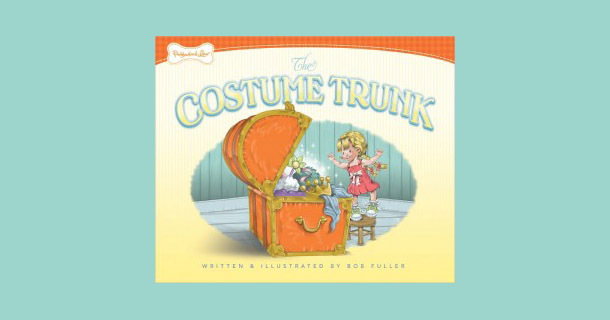 This post was inspired by The Costume Trunk by Bob Fuller. In this sweet children’s book, Courtney and her friends discover the magical world of Paddywhack Lane where all they need is their imagination to have fun. As a member of From Left to Write book club, I received a copy as fodder for this post. All opinions are my own. You can read other members’ posts starting July 28th at From Left to Write. 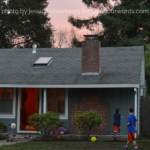 If you liked this post (or any others I’ve written along the way), I’d greatly appreciate your vote in the Circle of Moms SF Bay Area Mom Blog contest. Thank you for reading my words, supporting my blog and sharing your thoughts! Thank you for the reminder! I’ve been so busy trying to get things done lately I forget that my kids see the basket of clean laundry that I’m trying to fold-they see a boat! Or a bed. I should encourage it instead of stifling it. You mean I shouldn’t have just yelled at Little for turning his mandarin oranges into mush? Ah, life…a work in progress! I think the rest of us see the Internet as a place to get information and get in contact with friends and loved ones…. Amy – you see the Internet as a place to mold a generation of mothers and develop the largest “village” in which we virtually all help raise one another’s kids together … I’m pretty sure your imagination is well used (and well loved)! Since I can’t find the words, I’ll use a quote from one of my favorite movies (Father of the Bride), “Well that’s just about one of the best things I’ve ever heard.” Thank you for such beautiful words and a lovely thought. mine for a long time! Keep up these comments and YOU’RE going to be a favorite of mine for a long time. Thank you, my friend! What great things to learn from your kids! Yes, they’re constantly teaching me things. Most of which I appreciate! Great point! He went out with our nanny, so I don’t even know the answer! Tonight he wanted to sleep with a Batman figure, two plastic firemen, three matchbox cars and a plastic dinosaur. I see a mom who’s passionate about her children and uses her imagination and friends to find fun adventures for her family both at home and in this beautiful Bay area where she lives. Then she has the resourses and insights to write such heartwarming and wise essays about their life together! Well done, Amy.